Even when the greatest care is taken, a major risk remains that externally unrecognizable casting flaws like porosity, pores, voids, heat cracks, changes in dimension and inclusions occur due to the complex interactions in the casting process. 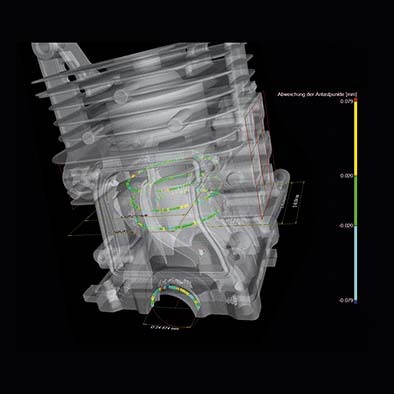 By use of X-ray inspection and Computed Tomography with YXLON products they can easily be detected and analyzed. Furthermore, CT Metrology provides possibilities in the field of measurement technologies which exceed tactile and optical techniques by far. To put it in a nutshell, CT metrology refers to the technology of using computed tomography to measure dimensionally. Why is that necessary? Because the more compactly components are manufactured, the more important it is to not only analyze defects accurately: specifying inner and outer geometries with precision is just as much a necessity. These tasks can be performed successfully with the help of computed tomography because CT delivers results even when optical or tactile measurement methods reach their limits. Unlike tactile and optical procedures for measuring, CT technology produces volume datasets that contain all the geometric information about an inspection item. In turn, a wide range of extensive analyses can be carried out on the basis of this data. An almost unlimited number of reference points can be used to measure the complete item, to ascertain the presence of cavities, and to define material interfaces in the case of modules and hybrids. Air inclusions and foreign bodies can not only be found but localized with the greatest precision. Analyses of blowholes and pores evaluate the inspection item using specified tolerances. Wall thicknesses can be tested accurately and assessed in comparison to CAD data. And to top things off, even construction design data can be corrected and the end product optimized on the basis of the CT data in a process called reverse engineering. The basic principle behind a computed tomography system’s ability for metrology is optimizing the so-called imaging chain in alignment with the demands the measurement findings have to fulfill. A high-power X-ray tube and a high-resolution detector that ensure optimum detail detectability are not the only prerequisite for dimensional measurement via CT. It’s much more so that the particular stability of the focal spot represents a key condition for reliable and reproducible measurement results. The only way to assure this stability is through a constant ambient temperature, in other words a maximum compensation of the heat produced when generating X-ray radiation. A water-cooled X-ray tube such as those from the YXLON Feinfocus FXE series has proven itself successfully here. In the same vein, stability for manipulating the inspection item has to be guaranteed, too. The item must be able to be inserted, secured and aligned within the CT system precisely and repeatably. This is supported by special item holders and extremely precise measurement unit standards, also known as etalons. Since granite reacts relatively inertly to thermal influences, it forms the best basis for a manipulator that remains stable and precise in the long run. The possibility to freely choose the focus-to-detector distance (FDD) and focus-to-object distance (FOD) makes it possible to obtain optimum, highly detailed image quality. An automatic crash guard safeguards the paths the inspection item traverses using software that functions considerably more accurately than operators could manually via optical inspection control. All of these requirements and empirical values were able to be implemented successfully in the YXLON FF20/35 CT systems. Once the inspection item has been completely scanned, both reconstruction using the appropriate reconstruction software and diverse measurement tasks using the selected analysis software are carried out independently by the CT system and independent of the inspection item involved. Depending on the specification, the measurements’ precision is checked and verified using calibrated test specimens. Repetitive accuracy must be regularly monitored and documented. System traceability and precision are tested and documented by means of the German VDI/VDE 2630 Technical Guideline. The goals in employing this technology are future-proof quality assurance, developing and testing new products with complex inner structures, and optimizing production processes on the whole. 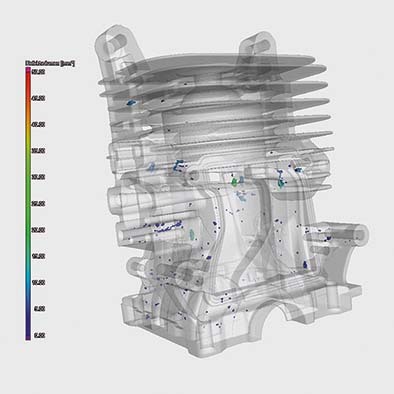 The product safety and functionality of a complex cylinder head, which in our case is already fully machined and finished, can be tested and assured via CT metrology. Within the framework of quality assurance, for example, inclusions, voids, pores and cracks in cast parts can all be detected and assessed simply and with certainty using CT metrology. The defect’s position and shape are depicted exactly, its dimensions measured precisely. Software carries out a defect analysis on the basis of predefined tolerance values. Depending on the requirement involved, the analysis can be depicted on the 3D volume visualization as well as on 2D cross-sections. In the event that trends are determined, the results are reported back to production in order to make necessary optimizations. Target/actual comparisons are implemented quickly and easily via computed tomography: CT data are compared directly with CAD data. Identifying variances through actual/actual comparisons toward monitoring the manufacturing process, among individual batches or against a sample template status can equally be derived without problems and without becoming time-intensive. Variances are detected at a glance and subsequently visualized and evaluated by the software using color and measurement scales while taking predefined tolerances into account. Precise surface measurements ensure the inspection item’s safety and functional ability. Are the wall thicknesses sufficient in compliance with specifications, passageways clear and unobstructed, cylinders a perfect fit, and the threads for bolts and screws correctly dimensioned? CT metrology safeguards the functionality of inner and outer structures directly following production on a non-destructive basis. 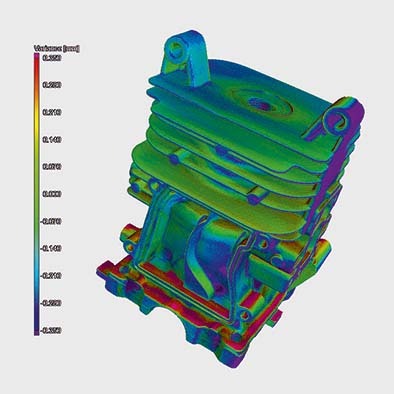 CT metrology also enables dependable implementation of the P 201/202 reference guidelines for “Enhanced Porosity Analysis” as issued by VDG, the Association of German Foundry Professionals. The amount of porosity is analyzed, especially at critical points, and then ensured that a defined value is not being exceeded. Voids can be accurately analyzed and evaluated in order to eliminate the risk of breakage. 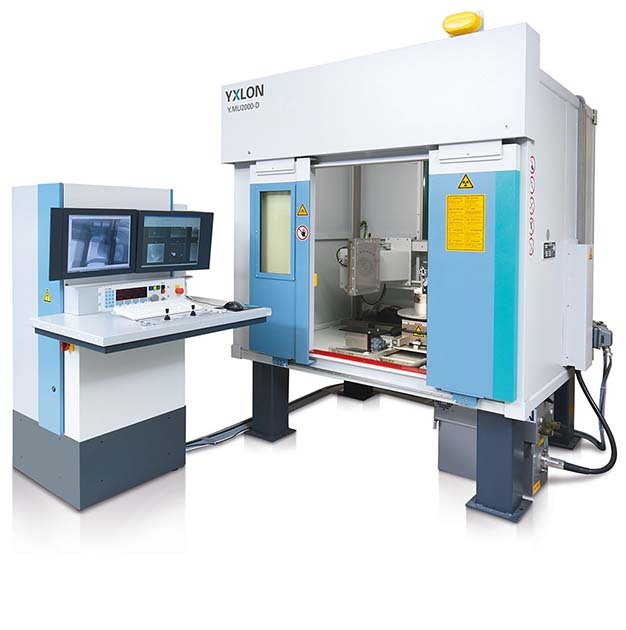 Worldwide, YXLON International is the leading provider of X-ray inspection equipment for industrial applications. Whether operated manually, semi-automatically or on a fully automatic scale, we have the right solution to match nearly every application. For us, the highest priority is placed on quality: the quality of our inspection systems and, as a result, the quality of your products. Our years of experience and the pleasure we take in innovation have enabled us to gain the confidence and trust of many manufacturers. As a result, our systems are deployed just as frequently at major automotive manufacturers as they are at the aviation & aerospace giants. Among our customers are foundries active on a global scale, well-known tire manufacturers and also universities and institutions. As far back as 1997 we had already brought a standard system onto the international market, the universal X-ray inspection cabinet MU2000, which is still deployed worldwide in research, development and production. From August 2013 it is also available and upgradable with computed tomography. A Metrology package is in development.